We are introducing services for those visiting Kanazawa, Japan, from abroad. May you have a pleasant stay in Japan! We’re widening the scope of the unlimited bus ticket, connecting Nagoya, Takayama, Shirakawa, Kanazawa and more, with tickets including access to Komatsu and Chubu Centrair airports as a special offer set. Kanazawa City, Ishikawa Prefecture, from its history, is a land which is full of expressions that both old and new Japanese culture have cultivated. Traditional culture coming down from old times is intertwined with modern culture, which has resulted in an exclusive and unique town. 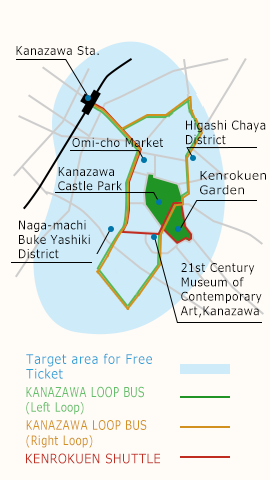 The ONE DAY PASS is being offered so visitors can take the bus around such places as Kanazawa City center at a great price. 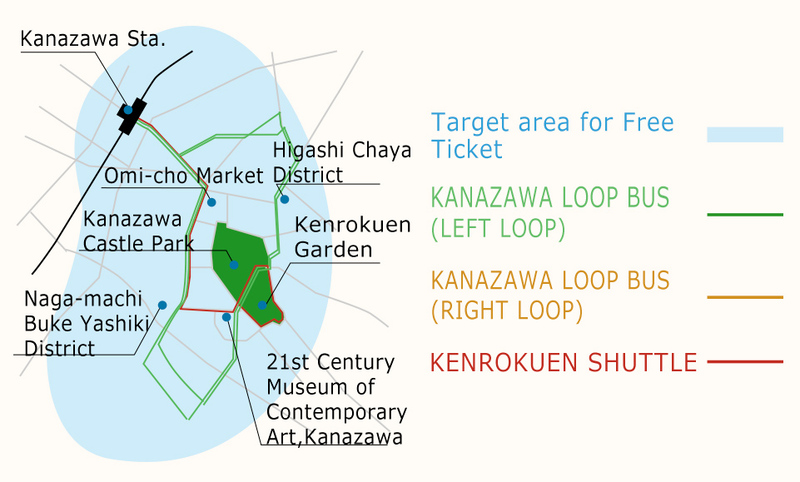 With the ONE DAY PASS, you can take a bus in designated areas, and on buses including the KANAZAWA LOOP BUS, and the KENROKUEN SHUTTLE. Also, you can visit famous sightseeing spots such as the Kenrokuen Garden and Kanazawa 21st Century Museum of Conremporary Art,Kanazawa, and it is also ideal for looking around the town where old vestiges remain. Also as a benefit, some of the fees for various facilities will be discounted with the presentation of the ticket. Why not try a carefree journey which is different from other tours by using the ONE DAY PASS? During your visit, please use it to experience the city of Kanazawa. Access from Kanazawa to various places has also been enhanced. We also provide a comfortable bus journey to not only the neighborhood but also other distant places. We are introducing services for those visiting Kanazawa, Japan, from abroad. May you have a pleasant stay in Japan!